You can automatically send text and email confirmations and reminders to your clients prior to an appointment. Free up your staff and reduce no-shows today! Rosy automatically sends a text message reminder hours before, as well as an email and text confirmation days before every appointment. You decide exactly when they are sent with a simple one-time setup. This virtually eliminates no-shows and late arrivals. Rosy will also send text messages to your staff to alert them of new or changed appointments. 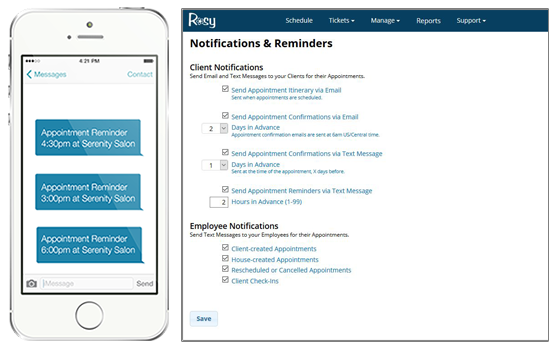 With Rosy Salon Software, keeping your clients and staff informed and on schedule has never been easier!